Hi there, last week it was about non-traditional holiday cards, so this week, we are focusing on Red and Green, so of course I wanted to play along in the challenge. 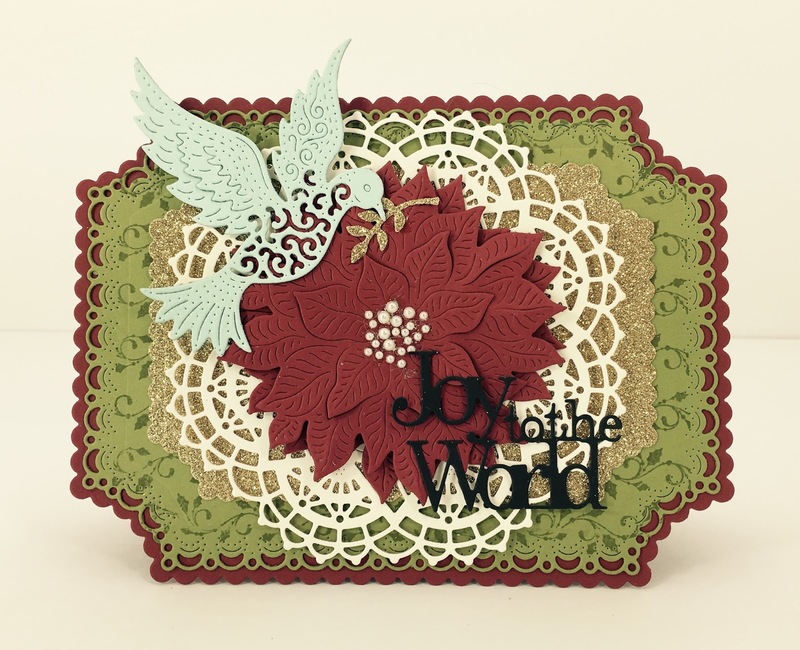 To create my card I created my card base using two different dies, Horizon Coved Rectangle Boutique Stacker Frames and Coved Rectangle Scalloped LG Stackers Nesting Dies. I used red green and gold glitter and stock. Than I die cut a Nautical Wheeler Doily using a cream card stock. Than I die cut two 3-D Poinsettia dies using red card stock and layered the on top of each other and added little pearls in the middle. I die cut the sentiment from the Joy to the World Wreath die set out of black card stock and added it to my flower and finally I die cut a Peace Dove out of light blue card stock to add to my flower. Hope you like this little card and here is the list of the dies I used to create it. Thanks for stopping by and hope to see your card this week for our challenge.